"Lyndhurst". I've envisioned this book for 25 years. With my historical society, we did a limited run of "The Pictorial History of Lyndhurst" in 1992, but "Lyndhurst" is my definitive work as it contains almost 200 photos from my collection. It started with an artistic obsession for photos of the Mayfield plank road. Since then I've compiled the photographic, oral and written history of our quaint hometown. My labor of love is complete with this publication. My 1950's aerial photo collection is unsurpassed in sharpness and clarity and begs for a magnifier for close inspection. That is the Lyndhurst of my youth. Please enjoy the fruits of my labor. This book is dedicated to Mom and Dad. - Thomas S. Treer, Lyndhurst Historian. 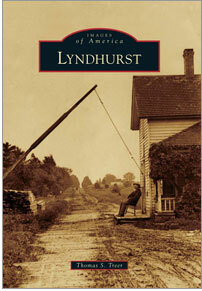 "Lyndhurst" is available at Joseph Beth, Borders, Barnes and Noble, Target and many other book stores, or order online. Thank you.